might be that he’s the hottest businessman in New Zealand (no need to bother Googling, that’s him at left), he should also get the award for being one of the most successful businessmen in New Zealand. Air New Zealand has a very strong product and it continues to profit despite the downturn. We talked about this, the success of the airline’s new airport concept (which allows customers to arrive as little as 15 minutes before departure), and more in the interview. The first half of our discussion centered around the airline’s latest, highly successful ad campaign where Rob and other employees took their clothes off. You can read that piece of the interview over on BNET. Here’s the second half of our conversation. Cranky: So how is the new airport check-in concept working out domestically? challenges would be there because we’re asking people to change their behavior quite significantly. The big pluses, the kind of hero-aspect of the new proposition, is for our regular travelers [aka frequent fliers] getting the RFID tag on the back of their phone. It’s a little tag that’s an inch by a half an inch. You see people walking around displaying this almost as a badge of honor, like a membership in an exclusive club. The benefit of that particular device sitting on their phone is what it means for the regular travelers domestically. We have far less complex security frameworks here in New Zealand than you have in the US, so that customer can now arrive at the airport and go directly through security. As long as they’re at the gate 10 minutes before the flight, all they do at the gate is they put this tag on the scanner, the device prints out a seat number, and they need no boarding pass, no e-ticket receipt. It typically means getting to the airport 15 to 20 minutes before flight departure. Cranky: Wow, that’s unheard of in the US. Rob: Yeah. And if you’re traveling with bags, that same passenger just puts the device on the kiosk, it automatically checks them in and prints out the bag tag. They take it over and put it on the conveyor belt. There’s no requirement to have any human interface, albeit we have plenty of help and assist staff to assist our passengers that are unfamiliar with the system. That same tag also gets you into the lounge. You swipe the tag and it says that you belong to the lounge. It also alerts our system that you’re at the airport and will be on time for your flight. For regular travelers, it works really, really well. The challenge we’ve got is that it’s a re-education process for people – those people who now have to put their bag on the conveyor themselves, for example. It’s getting that kind of familiarity. You used to take that bag to the counter. Now the counter doesn’t exist anymore, so you just take that bag an extra couple of steps. It saves time. The other challenge we find is connecting long haul passengers connecting into domestic flights. They have a lot of bags, but they come in relatively small numbers. We just make sure that they get the help they need. Cranky: So there aren’t any changes you want to make to the system. It’s just an education issue? Rob: Yeah. The system is working really well. It’s just an education process. At first we took the ticket counters away and we kept all the staff. In time, we would expect that through attrition, we would reduce the number of people there as passengers become more familiar with the process. Cranky: Let’s talk long haul a little. How is long haul demand holding up lately? Rob: Demand is down everywhere for us. Long haul demand is down 15% but capacity is down as well so our load factors are comparable year-on-year. The airline is still operating profitably. We reported a profit for our first half which was to the end of December 2008. Our second half we’d expect to be much more strongly profitable than the first half was. Part of the reason for that is although demand is down, Air New Zealand is predominantly a tourist airline so we don’t have the strength of business demand that other carriers have. The loss of the high-yielding business traffic is certainly causing a number of airlines to experience much stronger revenue reductions. The key for us is you just have to move quickly to adjust capacity. Cranky: I have to ask you specifically about one of my favorite routes – LAX to London. I’ve flown your airline on that route before, and it’s been great, but it’s a funny route since you aren’t a British or American carrier. How is it doing? Is that something that you would consider cutting in a down economy? How important is London? Rob: It’s a very important piece of the network for us. We’re predominantly an inbound carrier. About 70% of our traffic is inbound to New Zealand. After Australia, the UK is our second largest source of inbound tourists to New Zealand, so it’s very important for us to have it. We fly to London from both Hong Kong and LA. The LA route is the stronger of the two – probably because we get good support out of LA. Loads are quite good, albeit the yields are down. But like we say, we don’t have quite the same dependency on premium traffic that other carriers have. 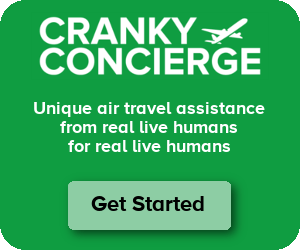 Cranky: It’s anecdotal, but I know several people with smaller companies who don’t have corporate contracts who prefer to fly Air New Zealand to London every time. Rob: We get great support from those who aren’t aligned with corporate agreements. We also get great support from the Hollywood movie industry. Cranky: Thanks for taking the time to talk. Can you imagine getting to the airport 15 minutes before departure and walking right on to the plane? If anyone has experience with the new airport concept in New Zealand, leave your thoughts in the comments down below. I won’t be dating any business men in New Zealand if that is the hottest guy they can come up with. I’ve flown NZ domestically, across the “ditch” (Tasman Sea) and long-haul between Auckland and Los Angeles. Not one issue on any service, ever. I truly have enjoyed their service. My only problem? They’re not oneworld. Even if I were Star United does not award miles for the lower end fares whereas AA offers at least 50% accrual on similar tickets. So Cranky thinks Rob Fyfe is hot, does that mean yours is a marriage on convenience (wink wink)……lol. No I used the link and read the story. How many airline heads in this country past or present could you add the title ‘hot’ to? For that matter just how many heads of an airline actually get involved and appear in ads or even get out and greet the public or their own employees. So good for him for getting involved. I just went back to the BNET story and watched the second youtube video on the “making” of the TV ad and you get to see and hear Mr Fyfe and the other employees in the TV ad video. Everyone should watch that video also. David SF – Yeah, please don’t tell me wife . . . . Hah. Of course, as you saw, it wasn’t me who decided he was hot but other Kiwis who bestowed the honor upon him. I have the Air NZ e-pass (RFID tag) and it works great. No more hassles because OLCI isn’t working or no access to a printer, or queueing up to get checked in. Just turn up at the airport, go through security (if it is a jet flight – for prop flights no security) and be at the gate 10 minutes before departure. I’ve used it a few times when in NZ earlier in the year. Works well, no problems even if you aren’t a ff. No long lines, jusf front up to the screen, type in your name and bingo – off to the gate in about twenty seconds all up. I only fly with Air New Zealand or Qantas! They are the two best airlines in the world! Air NZ is great I have never had a problem with them! Inc. long haul economy (15 hrs) they are fabulous! I love ANZ, I’ve flown to NZ a few times for business and the lounge, plane, people were all great. In fact even when I have to fly to Australia I try to find an excuse to go through NZ just so I can fly with ANZ. Flying from SFO to NZ you can’t help but compare the SFO United lounge with the ANZ NZ lounge. What a difference, free wireless, good food,… as opposed to the surly United staff in SFO handing you a ticket for drinks upstairs. Have had the fortune to use the new check in system when coming down to NZ on my current visit, an absolute breeze. Also flew down on Air NZ from LAX and very impressed with their product, had heard much about it and has certainly lived up to expectations. Great connections to major ports in Australia too, highly recommended. How are you my dear? I hope life is treating you well? If anyone deserves an angel to come and grant him some happiness its you. You were the start of a trip of a lifetime for me and my son Luke, as you know he isn’t very well and the care you care to us was professionalism to the nth degree tempered with empathy that I have never encountered in all my travels. Believe me I have travelled this world both with my career and for pleasure, you were how I remebered travel was; with my parents in the 50’s 60’s and when I was old enough to travel alone in the 70’s to the present day I have never encountered anyone who made a trip so enjoyable. I have been first class, business and cattle class, met all class of people, who were suppose to make a journey at least bearable, at best enjoyable, you and the group your work with were superb. Whoever put this group together, were touch with a little bit of genius, I have tried to contact the feedback but I want this email to go to the top. I will endeavour to send it to the CEO of NZ Air Rob Fyfe. Such service should be rewarded even if its just a note in your file I will never forget this group espically the core; John Karen Georgie David both Johathon. You made a difference. Coming back wan’t shabby either but nothing like what we experience with you people and also the return leg in LAX was a diappointment no where to sit and I realised too late that I could of used the Alliance lounge as I have a pass. Never mind it couldn’t take away from our trip. I fly in both Australia and New Zealand regularly and I am used to 15-30 min check ins. NZ is fantastic, but even Australia (Qantas anyway) is pretty good now and I seldom find I need to get there much more than 30 mins before flight time. I love ANZ internationally too. Not only is their service great – seats are good – but I generally check in just 60 mins before for an international flight. And *twice* now (don’t ask!) I have managed to find myself at the airport without my passport, told Air NZ, turned around, gone home and picked it up and got back with 30 mins until the international flight was due to leave and still got on. Another time this happened with Air NZ when I was in LAX and came in 30 mins before the flight time because of a delayed connection. And the lounges… there’s no comparison. Bircher muesli for breakfast before the trans-Tasman 6am flights is my favourite. I use them every chance I possibly can.